Are you a CBT therapist wanting to maintain your specialist skills and seeking an accredited CBT supervisor? Or perhaps you are interested in offering online therapy but don’t know where to start? I offer specialist CBT supervision and supervision for therapists considering starting out in online therapy, or who are already experienced and want ongoing peer support. Supervision can be offered on a 1:1 or group basis, all via video conferencing. Screen sharing allows for demonstrating how to use the technology with clients, as well sharing CBT formulations you may have drawn during therapy. I offer a restorative, reflective space in which to deepen your CBT practice. 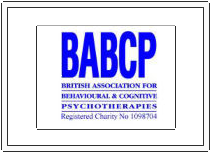 I am a fully accredited CBT practitioner with the British Association of Cognitive and Behavioural and Psychotherapies, and adhere to their good supervision guidelines. I encourage my supervisees to integrate regular audio recordings into their practice. Listening to audio clips in supervision promotes therapists’ micro-skills which, if combined with the Cognitive Therapy Rating Scale – Revised (CTS-R) (see Resources page to download it), can assist therapists seeking accreditation. I can offer advice to psychologists, therapists and counsellors considering working online on professional issues such as ethical secure practice for online counselling. I have expertise in a number of online platforms and can offer my advice and insights into their pros and cons. I can also signpost you to other useful sources of free information, such as good local training courses, the top online counselling podcasts, private practice consultancy websites and marketing gurus, so you can grow your practice. While I specialise in CBT and third wave approaches (ACT, mindfulness and compassion-focused therapy), as a clinical psychologist I am also trained to doctoral level in psychodynamic and systemic approaches. I often integrate attachment theory and mentalization-based therapy approaches in my supervision. I work ethically and securely, and adhere to professional guidelines on telepsychology (APA), online counselling (BACP) and web-based internet therapy in general (ACTO). You can download these guidelines, and other useful materials on my Resources page. Why pick me as your supervisor or consultant? I really enjoy supervision and have had excellent feedback throughout my career. And I love technology! I have a passionate belief in the democratising nature of the internet, especially when it comes to providing psychological therapy and counselling to those who may otherwise not be able to access it. I have extensive experience supervising pre- and post-registration CBT therapists, clinical psychologists, counselling psychologists and other health professionals. As a Senior Teaching Fellow at the University of Surrey, I regularly teach and mark CBT assignments, including formal evaluation of live therapy skills via audio recording. I conduct research and supervise trainee clinical psychologists on their own research into psychological therapies and mental health. I specialise in telemental health and telepsychology so have both academic, research and clinical expertise in this area. I love teaching and training about online therapy. I recently ran a day on digital mental health for trainee clinical psychologists at the University of Surrey - read about here. Another day I ran with Helen Pote of Royal Hollway was held at the British Psychological Society offices on 7th September 2018. We had the Mental Elf recording podcasts here and a YouTube video here (you have to wait a minute until it comes on). As a scientist practtioner, research is part of everything I do. For more information about the research I do at the University of Surrey click here or see my University of Surrey profile page for more details. I have also conducted research into mentalization validating a self-report measure with Prof Fonagy at UCL. Click here for more information. I offer individual supervision sessions at £70 per hour. Group supervision is £30 each participant for a 1.5 hour session. "Thank you so much for taking me on. I can honestly say I would not be as far along my path in psychology without your help and encouragement. The opportunities and the ways you've challenged me through thinking differently from a different perspective over the last 11 months have allowed me to develop much more than I could imagine - thank you!"